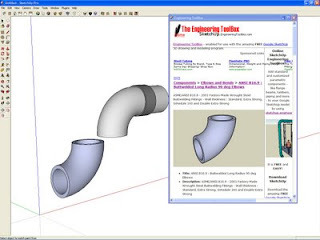 Retired SketchUp Blog: Elbows and Channels and Flanges! Oh, my! Elbows and Channels and Flanges! Oh, my! If you happen to fall under the Engineering, Construction or Facilities category, then please read on. We just found a new website that could be useful to you. Engineering Toolbox is a website dedicated to providing relevant basic information and data to the engineering and designing community. The best part about this discovery is the ruby plug-in for Google SketchUp; you can download standard and customized components like pipes, elbows, tee sections, lumber and beams. Download the Engineering Toolbox plug-in and use that welding neck flange you've always wanted. u know, it's a very nice attempt, but steel is rolled, and the engineering toolbox's shapes do not reflect this. and actually, SU already has a lot of these components constructed properly, albeit flat (but that's not really a problem). engineering toolbox's system of components is nice, just not quite detailed enough for accurate depiction on close-up details, which is what i use it for. all i get from it is a message: "method not allowed". The requested method POST is not allowed for the URL /index.html. Apache/1.3.39 Server at sketchup.engineeringtoolbox.com Port 80"
I see no messages in the console log." to which he responded quickly (and perfectly reasonably) that he would try to investigate after his holiday. Since Safari can see the target page ok, I'm guessing some interaction between the ruby code that supports webdialogue and Apache. The application works well on Windows computers but testing shows there is a problem with the Sketchup -Ruby - Safari implementation of Webdialogs with external urls on Mac computers. Unfortunate since this is a problem in the underlying Sketchup application it is out of reach for the ToolBox developer, and I hope the SketchUp team will address this problem in the next release of SketchUp. Until then - please use a Windows computer if available.